I’m about to retire the best light-work gloves I have ever owned. I’m not afraid to get my hands dirty but last year I bought a pair of Justin light leather gloves from Tractor Supply. I’ve used these gloves nearly every day for a year and the only reason I’m retiring them is due to some holes they’ve developed. It’s time. 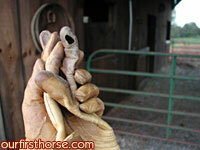 I used these gloves exclusively for barn work and riding, etc. No working on cars, no gardening. I like them so much because of the way they feel, tight enough for me to easily grip whatever I’m grabbing but not too tight to be comfortable. I think I paid $20 for them and they’ve been worth every penny. They will be replaced with the same exact Justin glove model, if I can find them. Definitely a “buy” recommendation from me.